Should governments have a say in what we eat? Should they care? 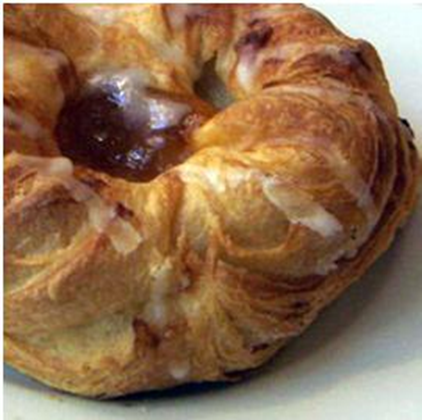 Just read the article below and see the picture of the world popular Danish pastry. Surely food scientists and food companies should be able to avail food ingredients that can provide a sumptuous yet nutritious Danish pastry. In October, Denmark implemented the world’s first tax that directly targets saturated fat in foods. Saturated fat, according to the World Health Organization, raises low-density lipoprotein (LDL) cholesterol levels which can increase the risk of cardio vascular disease. Saturated fat is found in foods from animal sources, such as butter and bacon. Any products which contain more than 2.3 percent saturated fat are subject to the tax. The consumer must pay an additional 16 Danish kroner (US$2.85) per kilogram (or 2.2 pounds) of any food product which has more than 2.3 per cent saturated fat. For example, consumers now have to pay 37 Danish kroner (US$6.50) instead of 34 Danish kroner (US$6) for a pound of cheese. The Danish pastry: this butter-intensive dessert is one example of the foods that will be taxed under the recently implemented law. (Photo credit: Wikimedia Commons). This tax was passed overwhelmingly by the Danish Parliament this past March. But there are serious concerns by the food industry, particularly organic dairy farmers, who worry about the potential loss in revenue from the tax and believe that the government is unfairly deeming their products unhealthy. According to an article in The Washington Post, the tax could prove to be regressive, putting a heavier burden on lower-income consumers. Furthermore, the likelihood of the tax to change dietary behavior is debatable. A study conducted by Lisa Powell and Frank Chaloupka of the University of Illinois at Chicago determined that, “Small taxes or subsidies [of unhealthy, energy-dense foods] are not likely to produce significant changes in BMI or obesity prevalence but that nontrivial pricing interventions may have some measurable effects.” Based on these findings, the tax could have little or no effect on food consumption habits in Denmark if it remains at the current rate. An alternative of directly taxing the producers of these food products would not likely lead to a different outcome, since the cost would be passed on to consumers anyway via price increases. I am reminded of the Christmas and end of year festivities not too far behind us. A number of us are preoccupied with shading off the extra weight, indeed unwanted we put on during this time. Yet it is these same people who keep coming across tempting sumptuous looking food such as the Danish pastry above. Well, it is also these same people who can google to read about juicing, detoxifying and so many other measures to take to try and get back to shape. Most likely, it also these same people for whom the price of food is not really an issue. It is not just the Danish pastry above that we should worry about. The Danish Government is going to tax consumers extra over its own specialty, and any other food deemed not healthy. Why should the government worry? But then if it does not, who will? I guess eating too much of the wrong types of food is just as risky as smoking, alcohol consumption and taking narcotics (is this stretching it too far)?It costs any government when its citizens are not healthy enough to work and when medical costs become high. Clearly, many of us reading this editorial would not have had a problem as far as enjoying foods of ourchoice during the festivities time. But, we probably all are aware of those who might have gone with no special food or with very little. As I talk about hunger in Africa, a friend informed me that right now there are beggars in the streets of her city (a city somewhere in Europe).I do not doubt that, especially given the economic problems that are being experienced all over. When people cannot afford food, the most basic of items, more likely than not they cannot afford housing, and clothing, and they cannot afford education for their children and healthcare for their families. But then, as always, I want to be hopeful. We have not yet reached the end of the road. Many times we look to governments to do everything. I have stopped blaming government for everything. I have done enough of that and am now tired. I have decided to look at me and my network of friends, locally and externally. I want to believe that inside each one of us, there is a need to help those who cannot help themselves.I believe each one of us can do something in our own little corner. Do whatever you can wherever you are. Find friends you can trust and support them for a cause that you care about.Around me, in my rural community where my project is, I see hungry children, I see mothers who can hardly provide a meal for their children. Yet, I worry about my weight; I am tempted to spend as much on a Danish pastry (which I do not need) as a mother would need to provide a whole meal for her family of six children. Just think about it; what would be the impact if each one of us made a contribution, however small towardsa hungry child’s meal, by forgoing a food item we know very well is not good for us? Many of us do so much already but could do more. Many of us probably do not think in these terms, but we could start. Let us not wait for our governments to embarrass us.